Occasionally I work with a database that stores dates and datetimes as UNIX timestamps, aka the number of seconds since midnight 1970-01-01. Unlike the original author of the database and surrounding code, I cannot convert between UNIX timestamps and human readable date formats in my head, so I write tools for that. Date and Time arithmetics are surprisingly hard to get right, and at the same time rather boring, hence I'm happy to delegate that part to libraries. Perl 6 ships with DateTime (somewhat inspired by the Perl 5 module of the same name) and Date (mostly blatantly stolen from Perl 5's Date::Simple module) in the core library. Those two will do the actual conversion, so we can focus on the input and output, and detecting the formats to decide in which direction to convert. $ perl6 -e "say DateTime.new(1450915200)"
Looks like we're almost done with one direction, right? $thing.^name is a call to a method of the meta class of $thing, and name asks it for its name. In other words, the name of the class. IntStr is a subclass of both Int and Str, which is why the DateTime constructor legitimately considers it a Str. The mechanism that parses command line arguments before they are passed on to MAIN converts the string from the command line to IntStr instead of Str, in order to not lose information in case we do want to treat it as a string. But the conditional is a bit clunky. Really, three comparisons to 0? all(...) creates a Junction, a composite value of several other values, that also stores a logical mode. When you compare a junction to another value, that comparison automatically applies to all the values in the junction. The if statement evaluates the junction in a boolean context, and in this case only returns True if all comparisons returned True as well. where "Z" indicates the UTC or "Zulu" timezone. The syntax formatter => ... in the context of an argument denotes a named argument, which means the name and not position in the argument list decides which parameter to bind to. This is very handy if there are a bunch of parameters. I don't like the code anymore, because the formatter is inline in the DateTime.new(...) call, which I find unclear. Yes, you can put a subroutine declaration inside the body of another subroutine declaration; a subroutine is just an ordinary lexical symbol, like a variable declared with my. In the line my $dt = DateTime.new(+$timestamp, formatter => &formatter);, the syntax &formatter refers to the subroutine as an object, without calling it. This being Perl 6, formatter => &formatter has a shortcut: :&formatter. As a general rule, if you want to fill a named parameter whose name is the name of a variable, and whose value is the value of the variable, you can create it by writing :$variable. And as an extension, :thing is short for thing => True. Now that the conversion from timestamps to dates and times works fine, let's look in the other direction. Our small tool needs to parse the input, and decide whether the input is a timestamp, or a date and optionally a time. But I hate boring, so I want to look at a more exciting (end extensible) approach. Perl 6 supports multiple dispatch. That means you can have multiple subroutines with the same name, but different signatures. And Perl 6 automatically decides which one to call. You have to explicitly enable this feature by writing multi sub instead of sub, so that Perl 6 can catch accidental redeclaration for you. Not quite what I had envisioned. The problem is again that the integer argument is converted automatically to IntStr, and both the Int and the Str multi (or candidate) accept that as an argument. The additional try in here is because subtype constraints behind a where are not supposed to throw an exception, just return a false value. So the named arguments to the constructor made me choose more self-explanatory variable names. 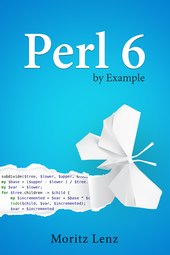 Now that the program is feature complete, we should strive to remove some clutter, and explore a few more awesome Perl 6 features. We've seen a bit of Date and DateTime arithmetic, but the exciting part is multiple dispatch, named arguments, subtype constraints with where clauses, given/when and the implicit $_ variable, and some serious magic when it comes to MAIN subs.